Front page of a document might be a cover or title of the project which don’t require a page number. Many people do these in different ways so, here we got three methods which can be used to hide page number in the first page of a document in Microsoft Word. This is the actual way to hide page number in the first page. Go to Insert> Page Number > Format Page Numbers this will open a dialog box here you will see page numbering then at the “Start at” field box enter the page from which numbering has to be started. [field box] then you will see the third page of your document will numbered as 1 and vice versa. I have seen many people doing these steps for hiding page number in the first page. Make a different document for the first page and leave the page number blank or set a Roman number as per your wish and for the main document you can use regular page numbering. This widely used when you have to use mixed page number in your document such as Roman and normal page number. After printing you can arrange the pages as you wish. Let’s say if you have index, reference, preface and many other pages like this to be numbered in Roman then you have to either create another document for these pages or you have to enter Roman numbers in each page manually and start the regular page number after these pages which can be done as mentioned in the method 1. This is a completely a manual method. You can manually enter page numbers in the entire document. This method is useful when you have to leave many page blank in a document. 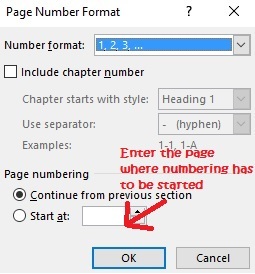 For example, you have to create big chapter pages in the middle of the document then using method 1 will cause page numbering in these pages so entire document must be numbered manually. Arrange pages after printing. These are the ways we have got to hide page number in the first page of the document. However, if you have got any suggestions please contact us.